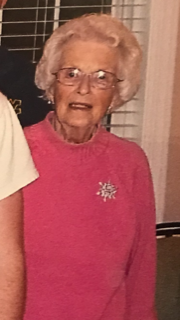 Lois Dodd Fullen, 89, of Union, West Virginia passed away on February 5th, 2019. She was born in Hinton, West Virginia to Virgil and Ora Mae Dodd. In addition to her parents, she was preceded in death by her brother Jerry Dodd, sister Ruth Dodd and her husband, Weller B (Whitey) Fullen. She graduated from Union High School in 1947 as Salutatorian. She is survived by her children, Beverly (Manfred), and sons Michael (Caroline), Patrick (Sharon) and Kelly (Laurie), as well as 15 grandchildren and numerous great-grandchildren. She retired from the Monroe County Board of Education after 30 years of service. She enjoyed board games, crossword puzzles, sports of all types and anything involving the West Virginia Mountaineers or the Marshall Thundering Herd. The viewing hours will be Saturday, February 9th 4-6 pm at Groves Funeral Home in Union, West Virginia. A short service will be held at Groves Funeral Home on Sunday, February 10 at 1:30 pm, followed by graveside rites at St. John’s Cemetery.